You cannot go anywhere these days without encountering businesses that have signed up to independent review sites. The positive is that businesses are finally waking up to the power of reviews - the negative is that some businesses are being 'sold' review solutions that benefit the review site more than their client. At HelpHound we have consistently said that 'there is a better way' and those of you who are clients or are regular readers of this blog will know that; but we make no apology for restating the case - and seriously questioning whether any business should commit to an independent review site. They are written by your customers about your products and services - so why would you want to give them to someone else? 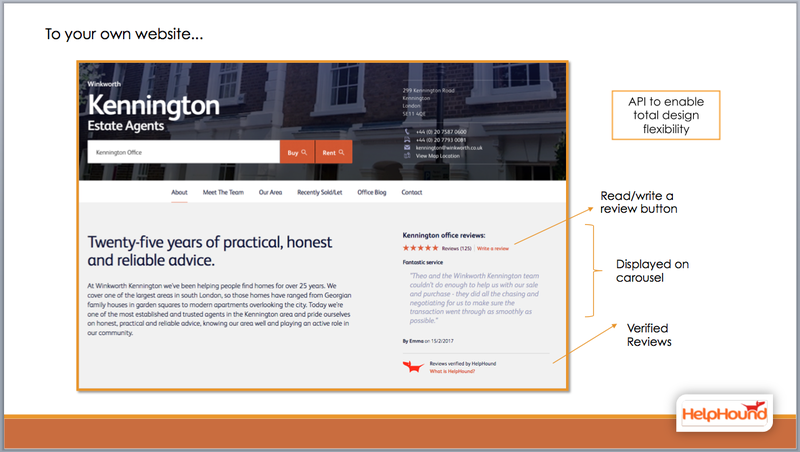 We have seen so many examples of businesses adopting one reviews solution, committing - wasting - time and effort, and then realising that there is a better alternative out there. This is a good example of professional review management - with HelpHound and the business working effectively together. 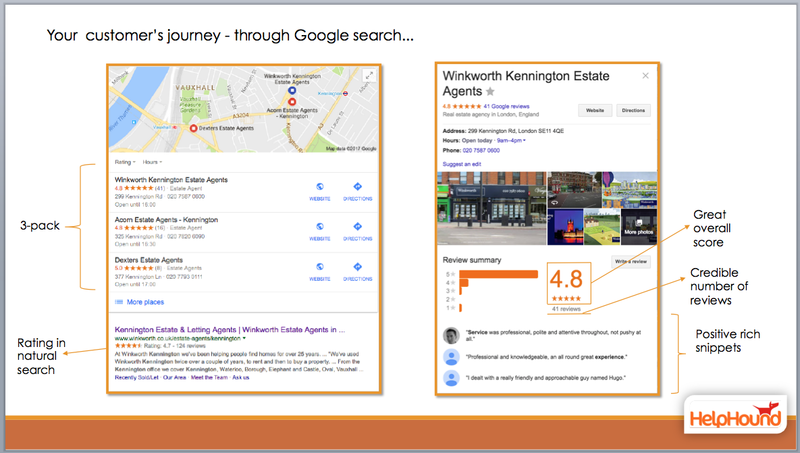 the business has over 100 reviews on its own site which are linked to by Google in the knowledge panel ("Reviews from the web") and displayed under its listing in natural search (top left). 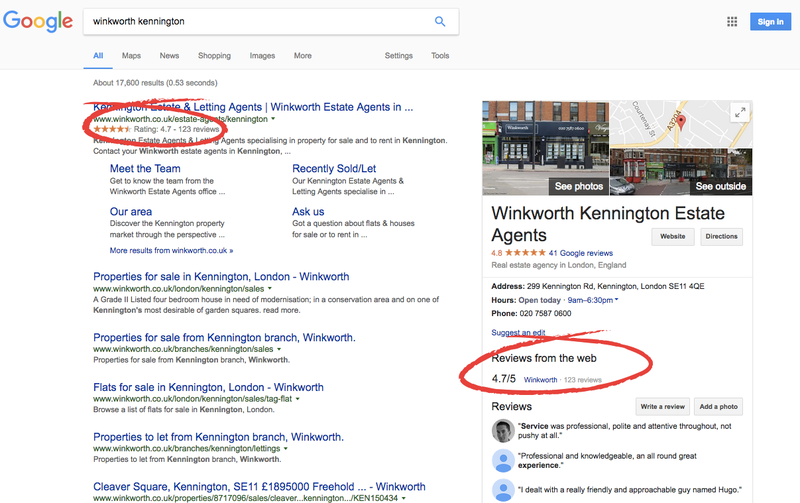 On top of that over 40 of those reviews have been got to Google, giving the business a great score there too, as well as three great rich snippets (at the bottom of the knowledge panel). *and then Facebook, and just one or two specialists sites (like TripAdvisor if you are in the hospitality business). So many review sites are not compliant with UK law; either they don't allow anyone to post a review or they only allow someone to post a review at a given time (usually immediately post-purchase). This is against the law - and the onus is on the business to comply. For more detail read this article. A dreadful score - when combined with the negative text of the six one star reviews - gives a terrible first impression of the business (Google reviews are always seen first). We would love to show you the individual reviews, but that would be unfair on the business in question; you will just have to trust us that they wouldn't encourage anyone to use it! Something we see more and more; the business invites its happy customers to post a review to the independent site - leading to a great score (it's not a 'perfect five' simply because the business cannot possibly identify 'happy' customers 100% of the time). The business's unhappy customers have either not been invited to write a review or they have decided to write it to Google instead - not all of them, but enough to create this negative score and impression. What should the business have done? What more could any business possibly want?